I don't think that it is technically the first fruit of spring (come to think of it, it isn't a fruit at all...it's a vegetable), but I begin to crave all of my favorite rhubarb recipes just as soon as there is a hint of Spring in the air. A couple of years ago I was counting on rhubarb's early annual arrival. I had promised to demonstrate a rhubarb upside down cake for an episode of Jayni's Kitchen. We were to film at the end of March. I looked everywhere for rhubarb and there was none to be had. Knowing that I would have to make something, I tried some frozen rhubarb to see how it would work in my cake. I discovered that with some manipulation, I could make it work, but it was not very nice and I really don't recommend it. (One of the difficulties of working with rhubarb is that it is very watery when cooked. Also, it doesn't hold its shape. It is crunchy one minute, mushy the next. The freezing process exacerbates all of these problems.) On the morning we were to film, I made one last ditch effort to find it at a grocery store on the way out of town. There it was. The first rhubarb of the year. Just in time. This year I have promised to teach a "Cornmeal Cake with Fresh Fruit" in a class at The Community Mercantile in Lawrence at the end of this month. Since getting rhubarb hasn't been a problem this year, I want the "fresh fruit" to be rhubarb. I have been enamored with the idea of rhubarb in a cornmeal cake ever since I read about Shuna Fish Lydon's cake. I made her version, and it was very good, but it just wasn't quite what I had in mind. So I have been testing cakes for a couple of weeks now. When I have something particular in mind, I can be kind of obsessed. The cake I had in my mind was light, moist and tender, with a bit of crunch from the cornmeal. I also wanted it to have a nice balance of sweetness from the cake and tartness from the rhubarb. I was telling a chef friend (Nancy, who makes wonderful cakes) about my current mission. She commented that I should just start over by taking one of my tried and true cake recipes and tweaking it to include the cornmeal and fruit. That evening, I made the winner (Thanks Nancy!). The cake I finally came up with is based on one of my old favorites—a European-style fruit torte. I altered the original recipe by substituting cornmeal for nut flour. Also, inspired by the similar, lovely little cakes I made from Cannelle et Vanille, I added some buttermilk. This seems to make for a moister, more tender cake. 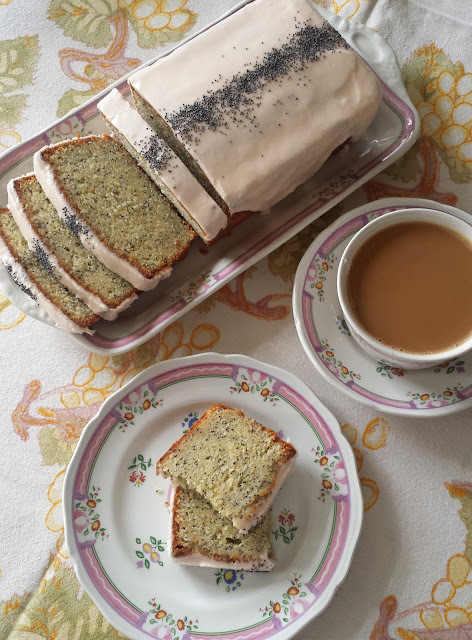 I kept all the things I especially liked from Shuna's cake—the rhubarb, cornmeal, cardamom and final sprinkle of turbinado sugar. This way I can maintain a nice ratio of fruit to cake just by sprinkling the rhubarb over the surface (and not folding any into the batter itself). The fact that the rhubarb gives up so much liquid as it cooks makes it difficult to put inside a cake. The rhubarb collapses as it bakes, releasing water into the baking cake. The cake is good the day it is made, but gets pretty soggy after that. Another advantage of having the rhubarb on the surface is that as it begins to release water as it cooks, some of that water will evaporate into the oven—the cake won't get soggy and the pieces of rhubarb themselves will have a more concentrated flavor. In addition to all of this, I love the look of the fluted edge. When you purchase rhubarb, make sure that it is firm and unbruised. The leaves contain toxic amounts of oxalic acid, so trim them completely away (they always leave a small amount of the leaf on at the store). Deep red stalks will produce the prettiest cake. If you don't care for rhubarb, I'm certain this cake would be great with other fruits—berries in particular are good partnered with cornmeal. Prune plums and apricots would also be tasty. Butter and flour a 10-inch fluted, removable bottom, tart pan (use a 10-inch round cake pan if you don't have a tart pan—line the pan with parchment). In a small bowl, combine the flour, cornmeal, baking powder, salt and cardamom. Set aside. Briefly cream the butter and sugars until smooth. Add the zest and vanilla and continue to cream until light and fluffy—3 to 5 minutes. Beat in the eggs one at a time, scraping down the bowl after each addition. After adding the last egg, briefly beat until the mixture is once again light and fluffy. Fold in half of the dry ingredients, followed by the buttermilk and finishing with the remaining dry ingredients. Scrape the batter into the prepared pan, spreading evenly. Arrange the fruit evenly on top and sprinkle with the Turbinado sugar. Bake the cake in a pre-heated 350° oven until a toothpick inserted in the center (in the cake, not the fruit) comes out clean—about 35 to 40 minutes. Cool. Sprinkle with powdered sugar and serve. Serves 8. Ice cream, crème fraiche or whipped cream would all make fine additions, but the cake was great all on its own. For me, the acid test would be how it held overnight. I had some for breakfast. It passed the test. This not only looks pretty it sounds delicious! We had a change in our menu this weekend. The rhubarb cake with cornmeal is going into the oven now. Not fearful of eggs - batter was very really delish. A surprise dessert on Thursday. Can't wait. I'm so glad you enjoyed it! Thank you for taking the time to let me know.